I just love writing about my baby girl. Thanks to everyone who read Part 1 yesterday. Thursday night was a sleepless one and I was up early, grieving and trying to make a good decision. We were leaning toward going in that morning but I just felt all this hesitance. Maybe it was nervousness. Yeah, I was definitely nervous. Nervous about labor. Nervous about being in a hospital. Nervous about holding Olivia and saying goodbye. I wondered if I would ever want to leave her. Would holding her for hours be enough? I sat in the dark, on the edge of my bed and couldn't get a thought straight in my head. As someone who wants wholeheartedly to follow the plans God has for my life, I felt this conflict between wanting to hear the Lord about the timing but also needing a deep, personal conviction that I was doing the right thing. In the midst of all my rambling thoughts, God came near. I knew that day, June 22, would be Olivia's birthday. *sigh* Birth...day? More like deathday. I looked briefly at my phone and there was an email from a friend who had a similar experience years before. The first piece of advice she gave was to not wait to go to the hospital and it confirmed what I had just resolved. Time to get ready. Time to take a pill that would start contractions. Time to pack a hospital bag. Time to come face-to-face with the inevitable. We checked in at Labor & Delivery at Harris Methodist downtown and they called me a "TLC" patient and put us at the end of the hall, where we wouldn't have to hear the joy coming from other rooms. The staff was truly remarkable and it exceeded my every hope for the care and compassion they extended towards us. I felt loved. They cried with us and made us feel like family. Even now, thinking back, I am amazed at how things fell into place. Thank God. Hours and hours of nothing but napping, staring blankly at Brad, checking email, and watching stupid TV. I got to eat lunch, which I hear is unusual for a labor patient, but they brought me a salad, lasagna, breadsticks, and carrots. It was good - is hospital food supposed to be good?! I took a second nap around 3:00pm and when I woke up, I still hadn't dilated past a 1. Brad and I looked at each other and knew it was time to get this show on the road. They started me on Pitocin at 4:30pm and contractions finally started getting regular and more intense. Without sounding prideful or arrogant, I want to share a particularly intimate part of the story that I was most nervous about. At this point of the story, I'd had three babies and knew the pain of childbirth. I knew about transition and the ring of fire. I hadn't forgotten the excruciating pain, like some women describe "not remembering" once they have the baby in their arms. I told the nurse that I would want medication or an epidural when my pain level reached a "7" but I hadn't felt much more than 2-3 most of the day. 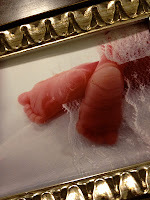 The sonogram that morning showed that Olivia was breech and they were concerned about her coming out bottom-first or feet first. They were concerned about my placenta detaching (it often doesn't when delivery is so pre-term) which would require surgery if I didn't have an epidural. But I wanted to birth her like I birthed my other kids. I wanted to be connected to the process and really have a sense of what was happening. I didn't want to be groggy or foggy once she was born but I had a realistic understanding of what labor would be like and didn't want the pain to make an already emotional situation, worse. Once the Pitocin kicked in, the contractions were so bearable, I could hardly believe it. My pain level went from a 3...to a 5...and then it was at a 6 and I was about to ask for some Demerol. My all-day, amazing nurse was getting ready to leave (shift-change) and so she and the new nurse stood at my bedside and ran through the day's events. I close my eyes and breathed through another contraction and could hear Joanie saying "She hasn't felt any pressure" to which I said, "Actually, I'm feeling a little bit of pressure." "Jesus, we ask for effective contractions and pushing. And, baby girl, it's time to go." And just like that, she came out entirely with a swift contraction and not a push on my part. The placenta came with her and they could immediately see the cord wrapped several times around her neck had caused her death. There were no angels singing and the room didn't fill with any sense of purpose or peace. I just felt the tears roll down my cheeks and could hear Brad sniffling, as he pressed his forehead against mine. The midwife, Candis, was crying as she prepared Olivia to be wrapped up and put in my arms. Oh, she was beautiful. Her eyes were open and she looked like all of our kids wrapped up into one sweet little face. Brad held her and cried and kept saying "She's ours, she's our daughter." It was such a strong moment to see my husband at the worst moment of his life. He was so brave for me and so good to Olivia that day. We said goodbye and kissed her feet. And I will miss her forever. 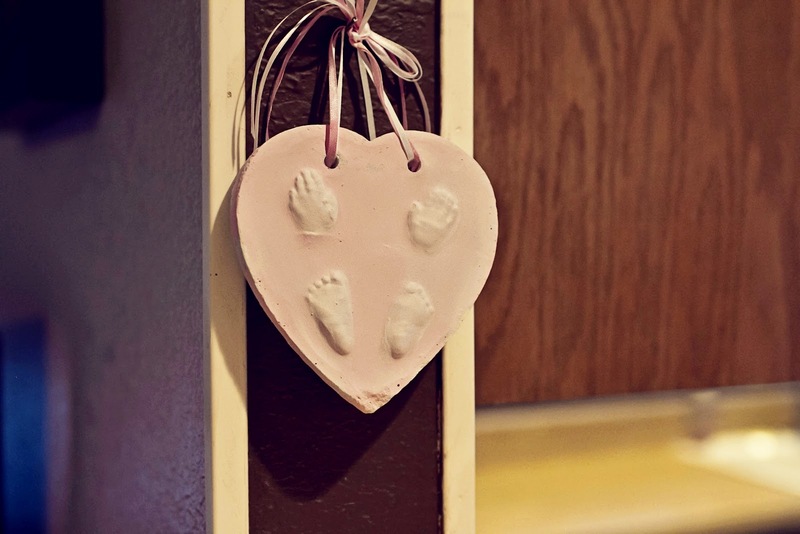 The hospital made imprints of her hands & feet that we will treasure always. Sweet friend... Thank you so much for sharing your story. I am so sad and so amazed at God's grace at the same time. I just love you so much. Olivia Jane, I wish I could have met you here and seen your beautiful Thompson-shaped eyes. You will be adored and missed by your mama and daddy until they see you again. What a day that will be, sweet girl! Heather, this is a beautiful tribute to what must be a wonderfully special daughter of our Father in Heaven. What a blessing for you and for her to have shared this brief time on earth with you. Thank you for sharing it.